Posted bycarlarjenkins	 November 24, 2017 Leave a comment on The Black Friday Store Is Now Open! Shop www.carlarjenkins.com/blackfriday NOW! Remember BLACKFRIDAY code gets you 15% off your entire purchase! You are getting 4 videos (2 bonuses) plus a full webinar with slides! Make your personal brand pop well into the end of 2017 and the start of 2018! You are getting 3 full webinars and slides plus 2 bonus videos. You are getting these 4 videos (2 bonuses) and 2 webinars with slides to help you on your way to better project management. 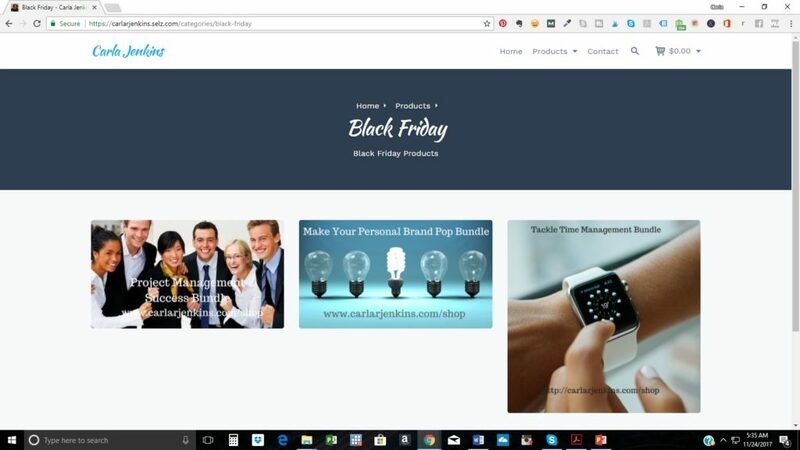 Shop my Black Friday Store NOW www.carlarjenkins.com/blackfriday! Use BLACKFRIDAY to save 15% off your purchase!